Through the thin, winter trees glazed over, I could see splotches of color toiling up the hill behind our house. I watched through the window. It was warm, there where I stood. Then the colors, so out of place on that white winter day, slid down the hill. I could hear the screams and laughter through the glass. I smiled when they lurched and rolled to a stop. 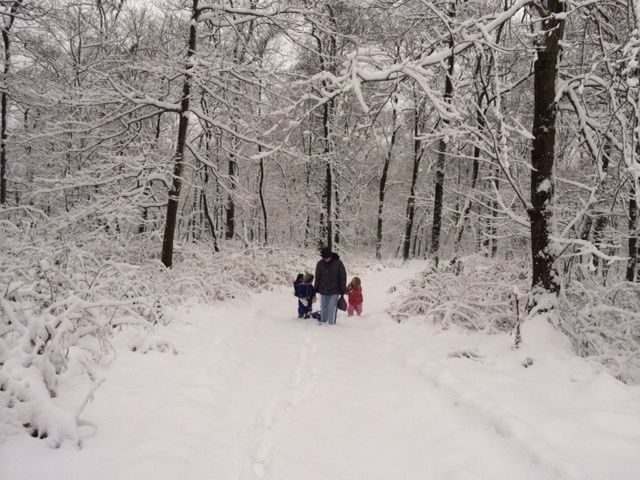 There’s something beautiful about watching your children enjoy the snow, about life in the cold. I walked down the lane, staring at my feet, choosing the places where the stones came up through the ice. Maile had driven away with the girls and I traveled slowly back towards the house, where Sam was napping in all of that natural light and Cade was reading Lloyd Alexander. Then a voice whispered, Stop. So I did. And I stood there and I looked around and I listened. I pulled up my hood because of the dry cold and I stood there without moving and suddenly the day I thought was so silent and barren came alive. I heard ice falling like glass from the frozen trees, sent plummeting by the wind or squirrels or time. Dry, dead, autumn leaves scratched their way along the brittle snow. A far-off wood-pecker thudded hesitantly, curiously, at some solid tree. There’s so much to be heard, if we’ll stop. If we’ll listen. I wonder if there was a young man my age out walking on that night a few thousand years ago. Maybe he had some white beginning to show in his beard, and a few children sleeping, their mouths hanging open (because I’m sure children slept that way, even a few thousand years ago). Maybe a voice whispered, Stop, so he did. And maybe, in the silence of a dark night, he heard the first screaming of a newborn baby, shrill and fresh, emanating from the edge of the village. What would I have done, if that would have been me? How long would I have stood in the darkness, in the silence, and listened? It’s pieces like this that have made you one of my favorite writers. Beautiful!